It took preservationists months to get the 19th-century machine ready to strut its stuff at the fair's opening day Sunday. WINDSOR — Bob Brann has heard the view that historic preservationists shouldn’t use the objects in their collections. That hasn’t stopped Brann, president of the Windsor Historical Society, from installing one ancient contraption after another on the Windsor Fairgrounds, then holding live demonstrations of their might. His latest project came together just last month, in time for the opening of the Windsor Fair on Sunday morning. Just before 11 a.m., Brann and two other volunteers from the historical society, Steve MacDonald and Jim Hawkes, turned on a diesel engine, causing a circular steel blade to start rotating 600 times a minute. Over the next half hour, they repeatedly slid a section of fallen pine tree through the flying blade. Then, they pulled the log back along a sliding carriage, adjusted it, and slid it through again. As pieces of lumber fell off the log, a loud buzzing noise and an evergreen scent floated over the north end of the fairgrounds, competing with the event’s other sights, sounds and smells: hay, manure, grilled onions, live country music. 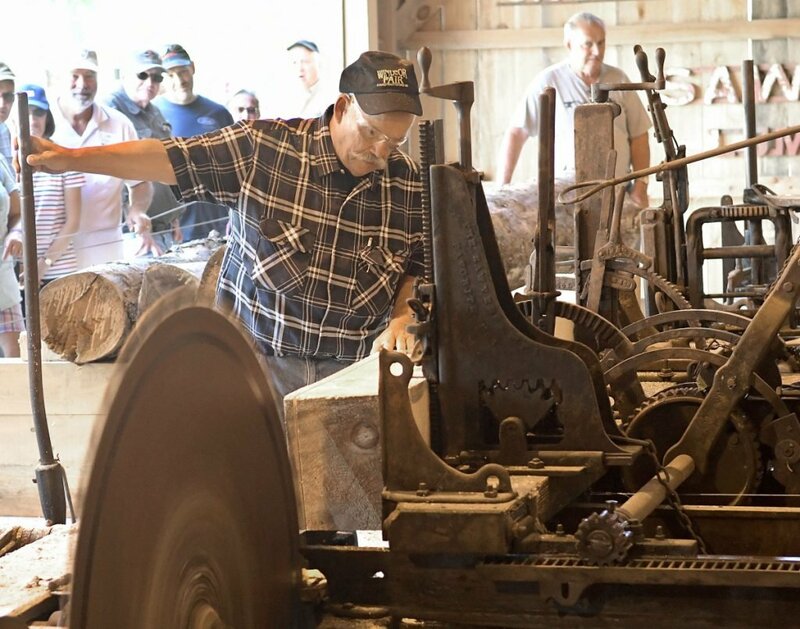 In the months leading up to the fair, the volunteers successfully moved a working, 19th-century sawmill from a property in Albion to the fairgrounds. About two dozen fairgoers watched the demonstration on Sunday morning, some using smartphones to document a technology developed more than a century earlier. “To me, it’s worth a lot more to show people how this stuff works,” Brann said. The sawmill has joined other historical exhibits already on display at the fairgrounds, including a working blacksmith forge and an assortment of old military equipment. The Windsor Historical Society also hopes to operate several other machines, including a windmill and a shingle mill. Brann has wanted to bring a working sawmill to the fairgrounds for years, but it was not until this past year that the pieces came together. Last summer, the Windsor Historical Society built the 94-by-24-foot post-and-beam building where it’s now housed. Also this past year, another member of the historical society, Hawkes, agreed to donate the sawmill to the group. Hawkes acquired it in the 1990s after moving onto the property where it was located, but he has sold that property. Before Hawkes acquired the mill, he said, it was used at a lumber yard operated by a man named C.M. Chalmers. It was originally manufactured in Harrison by T.H. Ricker & Sons, according to an inscription on it. For the last few months, another member of the Windsor Historical Society, MacDonald, has been working to restart the dormant machine. MacDonald, who recently retired from a career as an electrician at Bath Iron Works, said his boat-building knowledge helped him in that effort. Still, it wasn’t an easy task. Sawmills were originally built along rivers, MacDonald said, because they required rushing water to power the belts and pulleys that control the spinning blades. Those waterways also helped deliver logs to be milled. But to use the machine at the fairgrounds, the Windsor Historical Society had to connect it to a diesel engine, as well as install new belts and bearings. In July, after months of effort, the Windsor Historical Society finally made its first cut using the restored sawmill: a commemorative hunk of oak that hangs on the wall next to it. Now the group hopes to provide demonstrations for the rest of the fair, which ends on Labor Day. It also hopes to use the milled lumber to construct a shed near the sawmill, where power equipment will be stored.